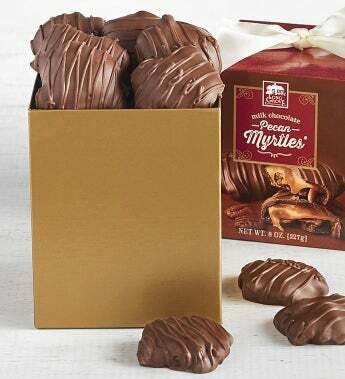 Myrtles Chocolates are the most prized creation of Long Grove Confectionery, a small artisanal chocolate shop that had it's beginnings in a picturesque midwestern village. Rich, buttery, handcrafted caramel is dropped onto large whole pecans and then covered in premium milk chocolate. Long Grove has also individually wrapped each piece for sharing and freshness.